We want to collect data about why our users cancel our product subscription. Or let our users cancel first, then show the form in the page after that? In my experience, I have gotten better results by combining the survey with the action of unsubscribing. If a user goes to the trouble of unsubscribing from something, they really want to, and are having some sort of negative experience that they want to alleviate. To retain as much goodwill as possible with the customer, let them do what they want -- cancel. To gather a bit of data before they leave, such as the answer to "Why?" then present them with a single set of radio buttons with predetermined answers, and one optional textarea to say more. The act of submitting the form both saves the data point and allows them to complete the action they want to perform. If you really need/want to ask more than one question, then in my experience the most successful response rates are when the questions are presented after the action. Again, this allows the user to complete what it is that they wanted to do; a very clear response on the resulting page that their action is complete, and then a clear (brief) appeal to provide feedback, is more likely to produce results than an up-front action blocker. It depends on your business priorities and values. If you put user experience above all, then you should make it as easy as possible to unsubscribe and ask for the reason at the "Your account has been closed successfully" screen. This will obviously reduce the number of responses but you won't hear horror stories about the number of hoops users had to jump in order to cancel their accounts with you. However, if you absolutely want to maximize the number of responses, then the survey should go on the "Are you sure you want to cancel?" page. However, if you do so, make sure to A/B test the copy explaining the need for survey because you want to "soothe the pain" of an additional step before cancellation. 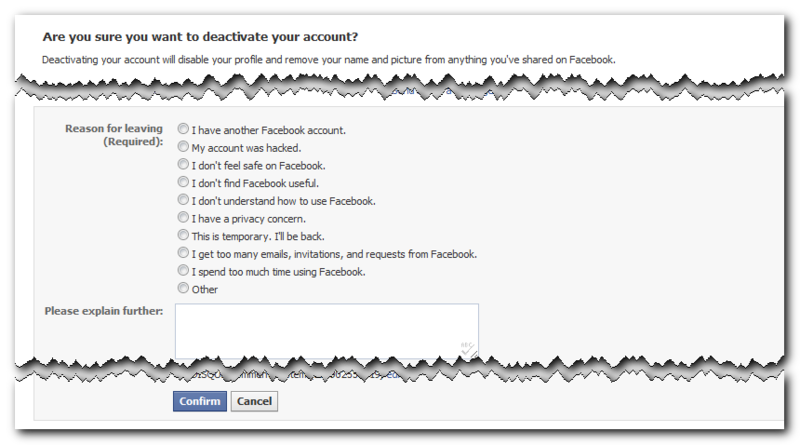 For example, Facebook's "Are you sure you want to deactivate your account?" elicits no other response "Yes, dammit, I want it yesterday!". I would let the users cancel their subscription, without being asked to answer a survey, otherwise it seems like you are trying to persuade them not to cancel. right after the cancel button I would provide a multiple choice question for a brief reason for cancelling and let the user opt in on answering a more detailed survey. Not the answer you're looking for? Browse other questions tagged forms usability web-app surveys or ask your own question.